As I am a number nerd, I think a lot about my own data. I thought I would have a quick look and see how far I can make my analysis my own data to help me make better working week decisions about my time. Do I travel to long? Do I have enough spare time? How much wasted time do I have? An I getting enough exercise? How far to I travel a week? 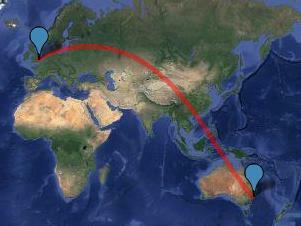 Where could I get to with the distance I travel in a week or year worth of miles from my working week? I took my working week and calculated the hours I spent doing particular activities. As I believe I spend to much of my week traveling . I like that my sleep is healthy after watching this ted talk (see below). It would be interesting to see how my data pattern changes over time.